This hydrating, nourishing, natural formula contains no chemical fillers or preservatives and is safe and effective for all ages and skin types. Also works wonderfully as a protective and healing rash ointment! 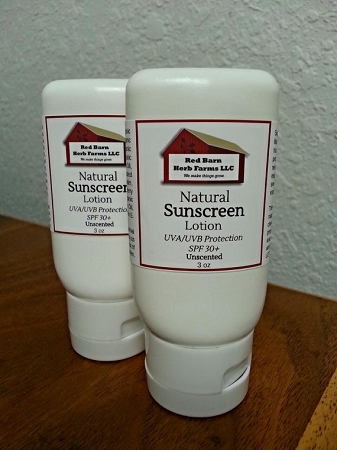 Natural UVA and UVB protection. Approximate SPF 30+. Ingredients: Organic Avocado Oil, Organic Mango Butter, Organic Shea Butter, Organic Extra Virgin Coconut Oil, Non-nano Uncoated Zinc Oxide Powder, Organic Red Raspberry Seed Oil, Organic Carrot Seed Oil, Beeswax, Vitamin E.
Suggested Usage: Apply liberally to exposed skin hourly as needed. This product has tested water resistant but we suggest reapplying after prolonged sweating or water exposure. Some whitening occurs upon application but quickly melts/dissolves onto skin. Organic oils and butters with natural SPF along with non-nano, uncoated zinc oxide (30%) safely provides excellent protection from the sun's harmful rays without penetrating the skin. Unscented - Has a very mild, natural scent from the butters and coconut oil.